Brazil - Brazilian singing brothers Diego & Diogo have recently filmed their debut DVD at the Nestle Auditorium in São José do Rio Pardo, São Paulo, using nearly 150 different Robe fixtures – including the brand new Pointe - with lighting services provided by São Paulo-based Showdesign. 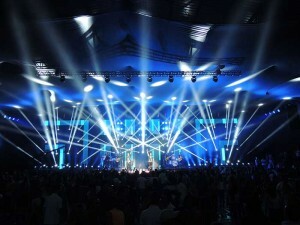 Lighting designer Leonardo Oliveira and Director of Photography Rogério Fernandez, both of Showdesign, were in charge of creating and supervising lighting to achieve great results for both live audience and the cameras that registered on all 17 songs for the soon-to-be-released DVD. 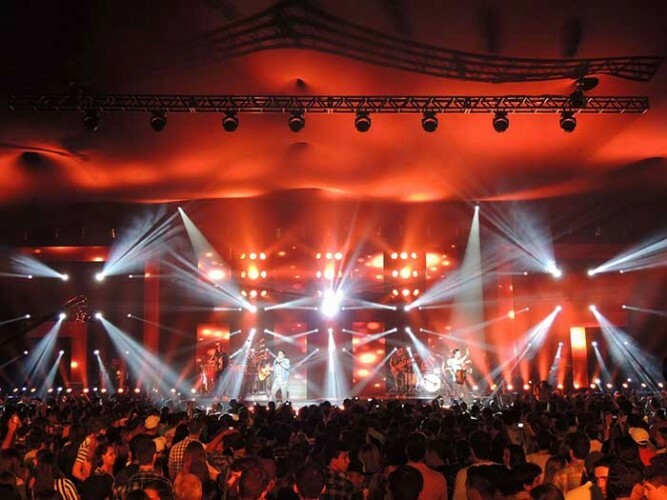 In total, 59 Pointes, 60 LEDWash 600s and 24 LEDBeam 100s, all from Robe’s ROBIN series, set the mood for this Brazilian ‘sertanejo’ music show. Showdesign worked for several weeks to create all the custom structures needed for the DVD record, including building the set and scenic elements and choosing the lighting fixtures. After seeing the new Pointe’s performance in the Barretos Festival in August, they decided to specify this as the main moving head in the set up. "We knew the Pointe was Robe’s latest technology and when we saw it in action, we really liked the dynamics and quality of light that it can offer," Oliveira comments. The stage was built in sections around different groups of lights. In the middle, there were three sections each containing nine Pointes and nine LEDWash 600s. On both sides of the stage were more blocks of the set, each lit with 16 Pointes, together with 12 LEDBeam 100s per side, located on the floor. The rest of the LEDWash 600s were used on the side walls and as front lighting. Oliveira was in charge of designing, programming and operating the show using a grandMA 2 lighting console plus a wing running OnPC software. He adds: "I really liked the scope and variety of the Pointe because it can act as a wash, a beam and a spot fixture. The zoom it has is much better than other units in its class ... plus it’s lightweight and fast. "The show has very distinctive sections. I’m using a lot of gobos thanks to the two really nice wheels available in the Pointe, together with the prism, frost, a varied colour wheel... I’m making good use of all the resources the Pointe offers." On the camera side, Fernandez states: "The director wanted to do something different, so we chose to use a very high colour temperature of 6200ºK with the help of the LED technology. In fact, all the lights in the set are LED based. That’s why the LEDWash 600 was a great choice - it enabled us to program the right colour temperature for every part of the show. Robe is a great brand - I love it!" Diego & Diogo are two young brothers born in the Mato Grosso state who presented their first album in 2003. Now, after launching this DVD, they will tour Brazil delighting crowds with their newest and most popular songs.